NEW YORK Peyton Manning and Adrian Peterson want to cap their sensational comebacks with Super Bowl appearances. For now, they can be proud of Pro Bowl spots. So can Redskins quarterback Robert Griffin III, one of two rookies chosen Wednesday for the Jan. 27 NFL all-star game. 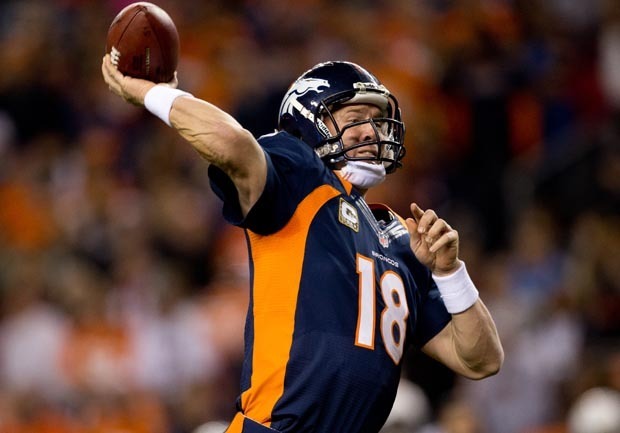 Manning missed all of the 2011 season with neck and back problems that required several operations. He then signed with Denver as a free agent and has led the Broncos on a 10-game winning streak to take the AFC West. "I know there's great players out there in the NFL, but there's some great players on this team this year that deserve to go," said Manning, whose 12th Pro Bowl is a record for quarterbacks. He ranks fourth in league passing this year, has thrown 34 touchdowns and 11 interceptions. Four other Broncos made the AFC roster: DE Elvis Dumervil, linebacker Von Miller, CB Champ Bailey and tackle Ryan Clady. Bailey's 12th appearance is a record for defensive backs. "My goal has always been to go out and help the team win and play at a high level," Manning added. "Anything that comes along with that, like being honored as a Pro Bowl selection, is very humbling." Minnesota's Peterson tore up his left knee on Christmas Eve last year, underwent major surgery, then was back for the season opener. He's gone from uncertain to unstoppable, running away with the rushing title with a career-high 1,898 yards and lifting the Vikings toward an NFC wild card. "Coming into the season after going through the rehab process, I just told myself that I wanted to lead my team to a championship and make sure that I contribute and do my part," Peterson said. "I've been doing it." Griffin is one of three rookie QBs who had superb debut seasons, along with Andrew Luck of Indianapolis and Russell Wilson of Seattle. Luck and Wilson weren't voted to the Pro Bowl by players, coaches and fans, although their teams are in the playoffs; Griffin can get to the postseason if Washington beats Dallas on Sunday. "You can't play down those kind of things," Griffin said. "I've always said my whole football career that you don't play for awards. They just come. You don't say you're going to win the Heisman. You don't say you're going to win MVP. You go out and you prove it on the field, and if everyone feels that way then they'll give you that award." San Francisco had the most players selected, nine, including six from its second-ranked defense. Houston was next with eight, six on offense. Kansas City, despite its 2-13 record that is tied with Jacksonville for worst in the league, had five Pro Bowlers, including RB Jamaal Charles, who like Peterson is coming back from a torn ACL. One other rookie, Minnesota kicker Blair Walsh, was chosen. Walsh has nine field goals of at least 50 yards, an NFL mark. The AFC kicker is at the other end of the spectrum: Cleveland's Phil Dawson earned his first selection in his 14th NFL season. Another record setter will be heading to Honolulu: Detroit WR Calvin Johnson. Johnson broke Jerry Rice's single-season yards receiving record and has 1,892 yards with a game left. Falcons tight end Tony Gonzalez set the record for Pro Bowls at his position by being chosen for the 13th time. The league's top two sackmasters, DEs Aldon Smith of San Francisco and J.J. Watt of Houston, were first-time selections. Watt has 20 1-2 sacks, one ahead of Smith; the NFL record is 22 1-2. Other newcomers, along with Griffin, Walsh and Dawson, were AFC players tackle Duane Brown and guard Wade Smith of Houston; safety LaRon Landry of the Jets; kick returner Jacoby Jones of Baltimore; and punter Dustin Colquitt of Kansas City. For the NFC, first-timers were Giants WR Victor Cruz; Atlanta WR Julio Jones; Seattle tackle Russell Okung and center Max Unger; San Francisco guard Mike Iupati, linebacker NaVorro Bowman and safety Donte Whitner; Chicago cornerback Tim Jennings and defensive tackle Henry Melton; Washington tackle Trent Williams and special teamer Lorenzo Alexander; Minnesota fullback Jerome Felton; Tampa Bay DT Gerald McCoy; and New Orleans punter Thomas Morstead. Eight teams had no Pro Bowl players: Carolina, Philadelphia and St. Louis in the NFC, Tennessee, Buffalo, Jacksonville, San Diego and Oakland in the AFC.